Development and history of UWBA from 2003 to present. January 2003: Committee formed and UWBA established. 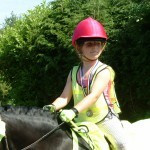 Aims and objectives were developed and the locality was assessed for the needs of horse riders. 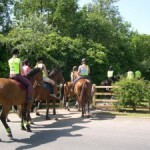 Plans were drawn up for developing new bridlepaths in the area. 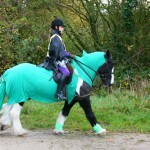 Jan 2003- Oct 2005 : Charity Commission status was obtained and we became a British Horse Society Affiliated Bridleways Group. Karla’S Way. 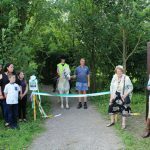 – a brand new path linking Ulnes Walton Lane with Malt Kiln Fold , allowing many horse users to avoid a busy and often congested stretch of road down Slater Lane.Much fundraising took place during this time to raise the cash for the project. 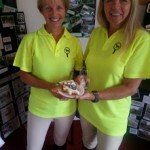 These included our Annual Spring Pleasure Rides, Christmas Shows and Fun day events, dressage competitions and showing shows. 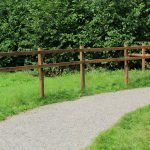 Additionally a lot of paperwork was involved in completing grant application forms to gain extra funding for the installation of the new path. 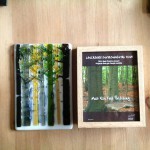 Many thanks to the fund-holders who granted us these funds including Harold & Alice Bridges fund . Early 2006: Work on Karla’s Way commenced. 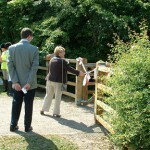 June 2006: Official Opening ceremony of Karla’s Way. 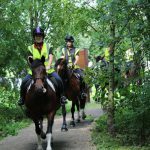 Many local riders attended the opening ceremony, followed by a pleasure ride thought the path and local areas led by the famous St. 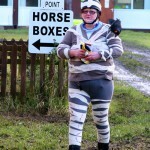 George!!! 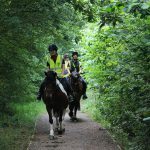 2006 – 2007: We continued to develop our relationship with SRBC to allow us to use some of the existing SRBS footpaths as bridlepaths . 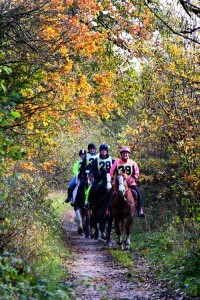 SRBC were very supportive of our work and appreciated the need for safe off road paths in the area . To this end we were granted permission to use Hocking Wood and Paradise Park paths on a trial basis on the understanding that the paths were regularly cleared of horse droppings and riders were to stick to the paths with no cantering/galloping through the area.This trial period was successful and our use continues to this day – with the same conditions attached of course. 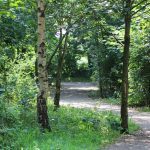 2008 : The continuing support from SRBC in allowing us to use Nixon Lane Woods path connecting Nixon Lane to Karla’s Way directly, rather than travelling down Ulnes Walton Lane, was challenged by objections from the local Womens Institute. 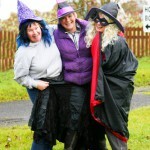 A series of meetings and surveys amongst local residents took place to try to justify our continued use of the path, but unfortunately the WI were quite vitriolic in their arguments, stirring up a lot of hostile feelings locally. 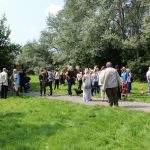 This culminated in a large and rather heated area committee meeting where SRBC had no alternative but to stop us using Nixon Lane Woods. 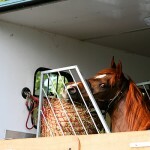 We did look at several alternatives, but to no avail. 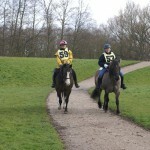 Horses still have to cross the traffic out onto Ulnes Walton Lane to pass from Nixon Lane end to Karla’s Way. This is ongoing. 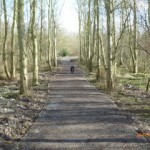 2008-2009 : A new path was laid from Moss Lane and the prison roundabout, up through the woods at the back of the prison and out onto Ridley Lanes, courtesy of Ulnes Walton Parish Council, the Prison Authority and Foresters Estates. 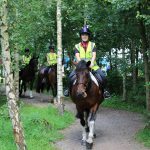 This really helped as it provided a circular route around the prison for walkers and horse riders alike, but also gave improved access to the SRBC paths for many horse riders from Croston, and vice versa. 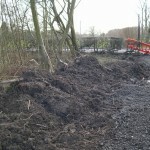 2008 – 2012: new projects were investigated including Rhoden Road, Ridley Lane, bridle paths around the SITA site on Ridley lane, and some tracks in Bretherton and Much Hoole, many of these involving SRBC, Ulnes Walton P. C. and Lancashire County Council. 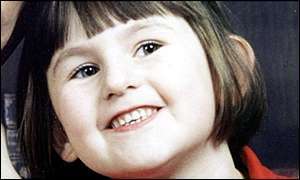 Some of these are still ongoing but various issues need resolving and this sort of investigation always takes time. 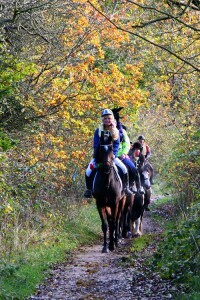 Fundraising activities continued throughout this period, and an additional pleasure event – The Halloween Ride was introduced each October. 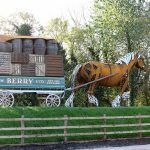 Our support grew and our relationship with SRBC continued to develop – we are now consulted whenever new plans are considered within the borough for building, road works or amenity development. 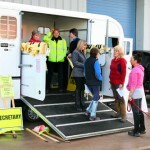 We also gained considerable support from the local Press. 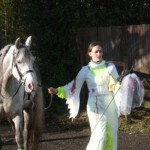 Press cuttings. 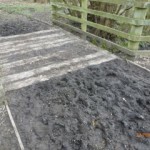 2012-2013: We decided that the only and original bridle path of the area, the Lostock Valley Bridlepath around part of the playing fields at Moss Side, had fallen into a sad state of repair. 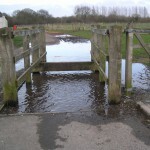 The sleeper bridge over the stream was unsafe, and the path itself was very boggy in parts. 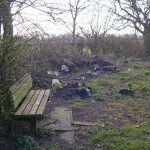 Our next mission was to raise funding to repair this. Working with SRBC plans were drawn up, which included piping the stream under the bridge, resurfacing and generally tidying up. 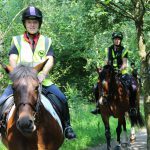 It was proposed to update the whole area by making the existing parallel footpath and bridle paths into one wide multiuser path, so creating much better access for all, including emergency vehicles. 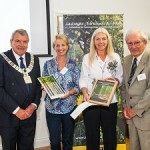 Grant applications were completed and we gratefully received funding from Veolia, Lancashire Environmental Fund, South Ribble Partnership, Howard and Alice Bridges Fund, Lafarge Tarmac and C & W Berry – a sincere thank you to all of them, it really was appreciated, and we hope that they are able to continue their support of us in the future. 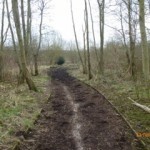 Winter 2013-Spring 2014 : Work commenced on upgrading the path which is now known as Malt Kiln Fold Bridleway, This took some time as the weather of the winter 2013-14 was particularly wet creating some very difficult conditions for the contractors to carry out the construction. 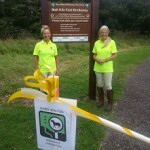 Summer 2014: The official opening of Malt Kiln Fold Bridleway took place. We held a ’grand’ opening ceremony at the Rugby Club Pavilion on the playing fields where we welcomed many guests with afternoon tea to help us celebrate. 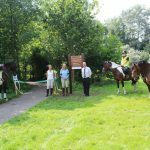 The Mayor of South Ribble was in attendance and the path was formally opened by Mr Mark Weston, Director of Access & Welfare of the British Horse Society. 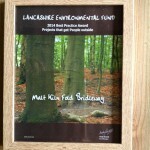 Autumn 2014: We were very pleased to be awarded the Lancashire Environmental Fund Best Practice Award for developing the Malt Kiln Fold Bridleway. 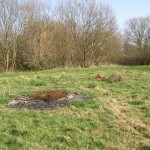 2014-2015 ongoing – Plans were drawn up with SRBC, Leyland Warriors Rugby Club and the Fishing Club to develop the whole of the area into Malt Kiln Fold Country Park. 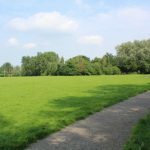 We proposed an extension to the new bridle path to form a full loop through the woods and all the way around the back of the playing fields. 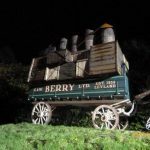 These plans were approved, but whilst funding has been obtained for approximately half of the required £60,000 we are still in the process of making grant applications and organising fundraising events to cover the full amount. 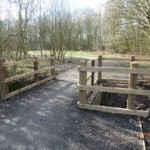 We anticipate that work will start on this path late 2015 early 2016 so watch this space. 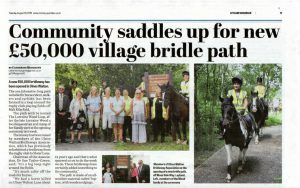 Lancashire Evening post article – The group has already pumped more than £20,000 into revamping the Malt Kiln Fold Bridleway in Moss Side in Leyland a year ago to create a safer place for horse riders to ride and they will use the new funds to extend the road. 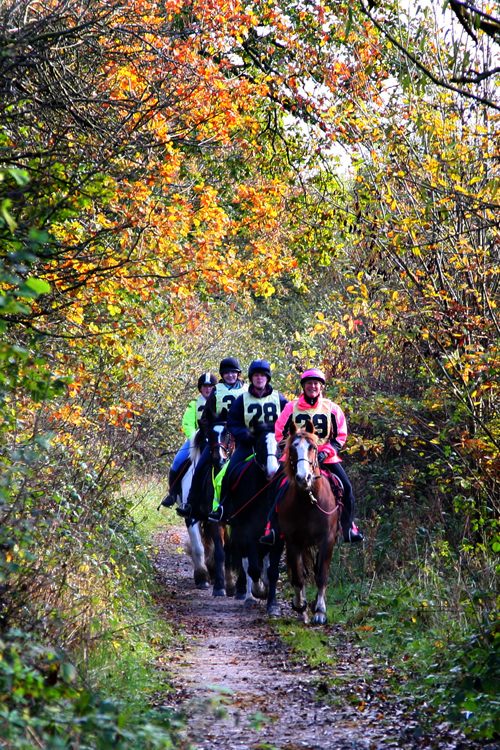 And club secretary Janet Berry says an extended bridleway will benefit the community as it will tie in with a £300,000 scheme to improve the Moss Side playing fields area aiding local sports clubs. 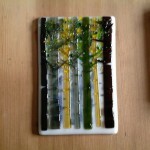 She said: “It is great because the money will make a massive difference. “The money will be used to extend the bridleway. 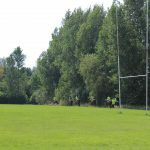 It will help spectators get to Leyland Warriors’ rugby club pitches and help people access the sports pitches easier. 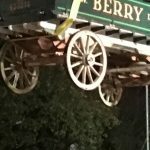 “The money will have a positive impact on the community. 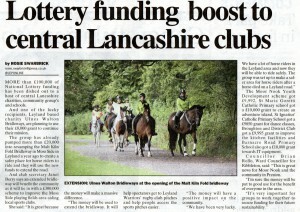 http://www.lep.co.uk/news/100k-lottery-funding-boost-to-central-lancashire-clubs-1-7281885 to read all about it. Brand new Lancashire pathway dedicated in memory of local horse rider. 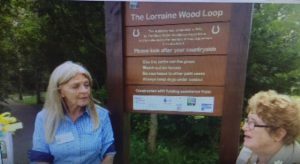 The Ulnes Walton Bridleways Association (UWBA) officially opened the newly created Lorraine Wood Loop which can now be enjoyed by riders, walkers and cyclists. 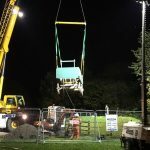 The work required on the route totalled £59,000 and was funded by the BHS, UWBA, Lancashire Enterprise Fund, Lancashire County Council, Howard & Alice Bridges and The National Lottery Fund, as well as the South Ribble Borough Council. Lorraine’s daughter Lisa and grandchildren were at the official opening yesterday (18.08.16), with grandson Jack cutting the ribbon. 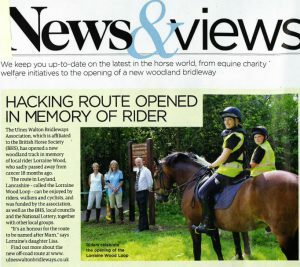 Lisa said: “It’s a real honour for the route to be named after mum, she really enjoyed horse riding and as she had stables close to here (she) would ride around the roads so it’s great to see safe off-road routes riders can now use”. 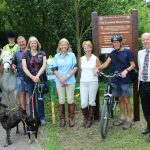 Dr Sue Taylor-Green, Chair of UWBA said: “We are extremely proud to have been able to create this new multi user path which contributes significantly to the enjoyment of all park users. 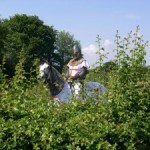 It is estimated that 20,000 rights of way in England and Wales will be extinguished from the maps if they are not recorded by 2026. 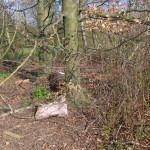 Government legislation (Countryside and Rights of Way Act 2000) states that pre-1949 routes must be recorded on a council’s Definitive Map or they will be erased. 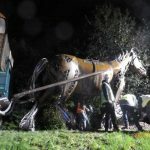 Hope you are all enjoying our wonderful horse sculpture ‘ Bobby the horse’ which was just put in place last Thursday evening. 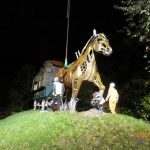 For those who haven’t seen it yet, it is on the grass mound, to the left of the roundabout as you drive south on the B5253 ( Flensburg Way,) from the Waste disposal roundabout (Tank roundabout) to the junction of Longmeanygate and Flensburg way. 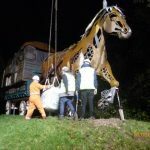 The idea originated a couple of years ago, as a war horse statue to commemorate the horse in WW1, but South Ribble Borough Council and C & W Berry came on board to support the structure and felt that it would be more in keeping if developed as part of the’ Transport in Leyland Theme’ which is displayed around the borough. 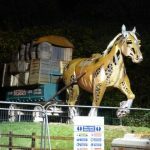 The resulting sculpture, as designed by DP Structure Ltd, really is superb and lives up to all our expectations. 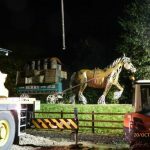 I think it might have come as a bit of a shock last Friday morning when people driving to work saw that a giant horse and cart had suddenly appeared on the roundabout. 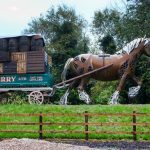 Considering our main aim was to celebrate the importance of the horse, it was quite poignant when we realized that the site of the structure had some 30 odd years previous, been the site of the original house and stables of a well-known local rag and bone man, and his famous horse Bobby. 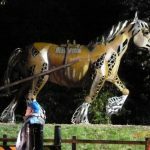 Hence the name of the sculpture is Bobby the horse. 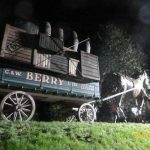 Ulnes Walton Bridleways Association would like to thank everyone for their support in allowing this project to come to fruition, especially C & W Berry for their funding and work on the wagon and South Ribble Borough Council for all their design, planning and funding . 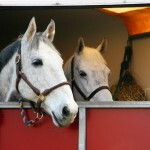 UWBA is so pleased to have promoted the importance of the horse in our community – past and present. 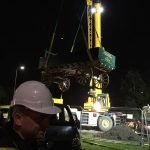 Meanwhile we are still working on various issues concerned with some of the other routes we are investigating. 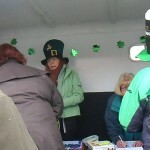 Your support at our fundraising events would be much appreciated as would any donations you care to make. Thank you to everyone who has supported us in our work to-date.